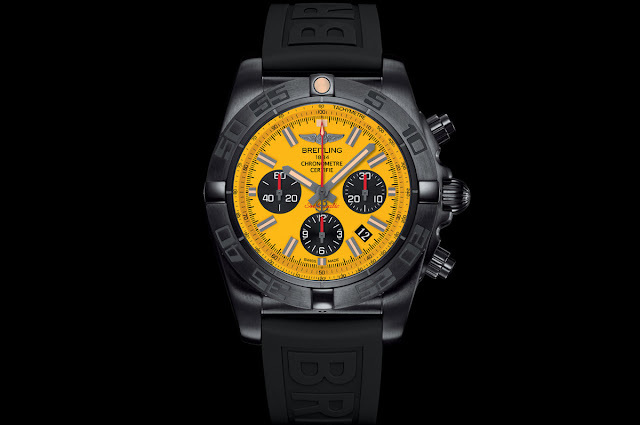 With the new Chronomat 44 Blacksteel Special Edition, Breitling gives a whole new face to its successful chronograph model. The 44 mm satin-brushed steel case with black carbon-based high-resistance treatment make a powerful contrast with the yellow dial – Breitling’s signature color – against which the black counters and red hands, together with the large luminescent-coated hour-markers and hands, ensure optimal readability. 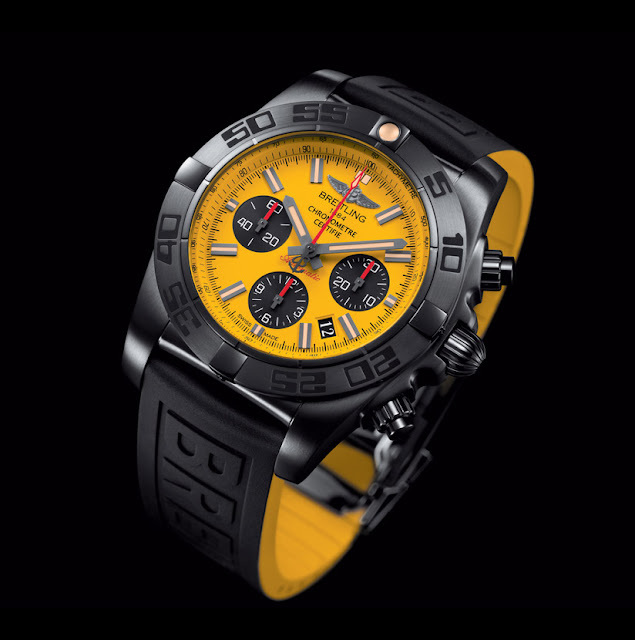 The screw-lock crown and safety push-pieces make the watch water resistant to 200 metres / 660 feet while the lateral reinforcements protect it against shocks. The unidirectional rotating bezel with black rubber-inlaid numerals is equipped with four polished rider tabs serving to measure times as well as facilitating handling. On the caseback, a black oscillating weight is visible through a transparent sapphire crystal. 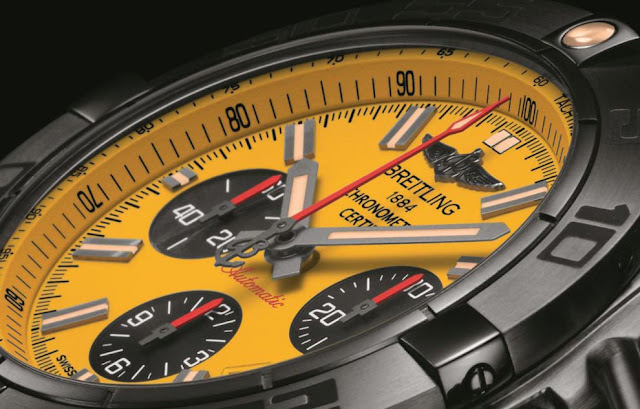 The Manufacture Breitling Calibre 01, chronometer-certified by the COSC (Swiss Official Chronometer Testing Institute), guarantees reliability and precision. 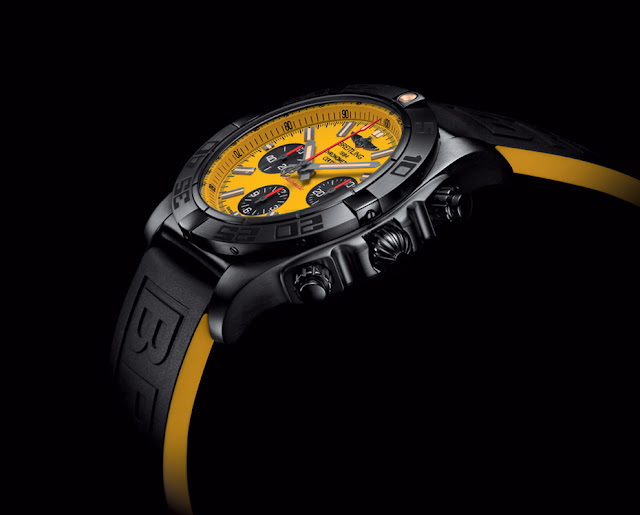 Beating at 28,800 vibrations per hour, the movement offers at least 70 hours of power reserve. Breitling Chronomat 44 Blacksteel Special Edition. 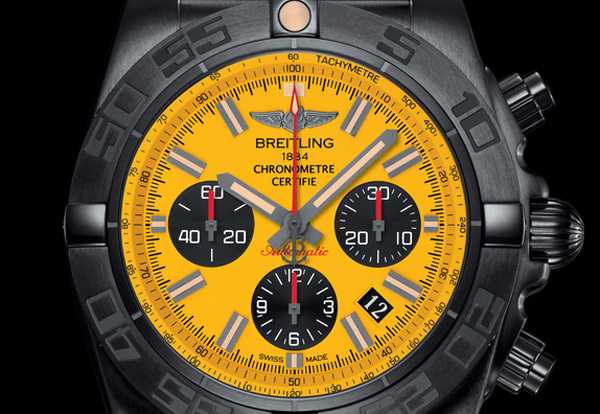 With the new Chronomat 44 Blacksteel Special Edition, Breitling gives a whole new face to its successful chronograph model. The two-tone rubber TwinPro strap combining a black exterior with a yellow lining completes the original look of the new Breitling Chronomat 44 Blacksteel Special Edition. Price to be announced.